Jeremy Pang is the chef and co-founder of School of Wok, London’s only cookery school for Chinese cuisine. Jeremy grew up in London and was initially on track to a career in biochemical engineering. *record scratch* He career path then took a few different twists and turns before he enrolled in culinary school at Le Cordon Bleu and then started School of Wok, at the time a mobile cookery school. That was a decade ago, and now School of Wok not only has established a brick-and-mortar cookery school in central London, but has expanded into products, like woks and meal kits, which are sold at grocery stores around the UK. He has also authored two cookbooks and he has a YouTube channel with over 75k subscribers where he teaches a lot of his favorite Chinese dishes in a way that’s super accessible for everyone. 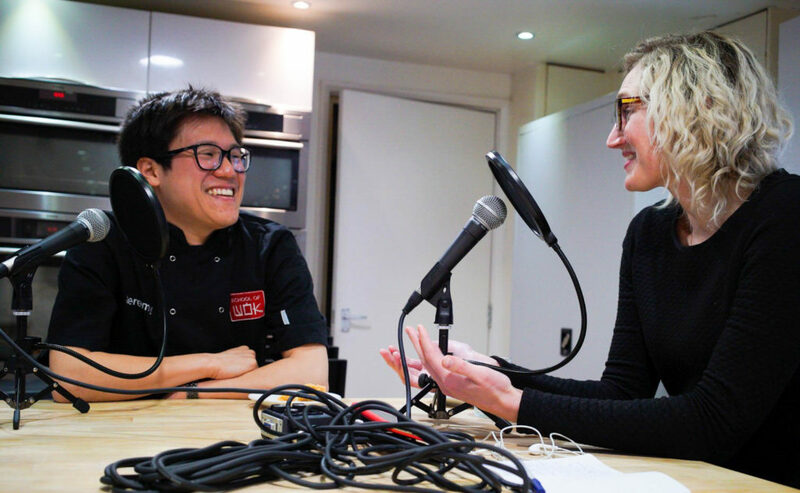 Katie Quinn interviewing Jeremy Pang at the School of Wok in Covent Garden, London. “You have to convince yourself that you’re more excited than you are scared,” is one of my favorite quotes from this episode, in which Jeremy talked about the rollercoaster of being an entrepreneur, although I think it applies to many aspects of life. Jeremy’s got hustle, but he also has so much joy. Enjoy the episode!